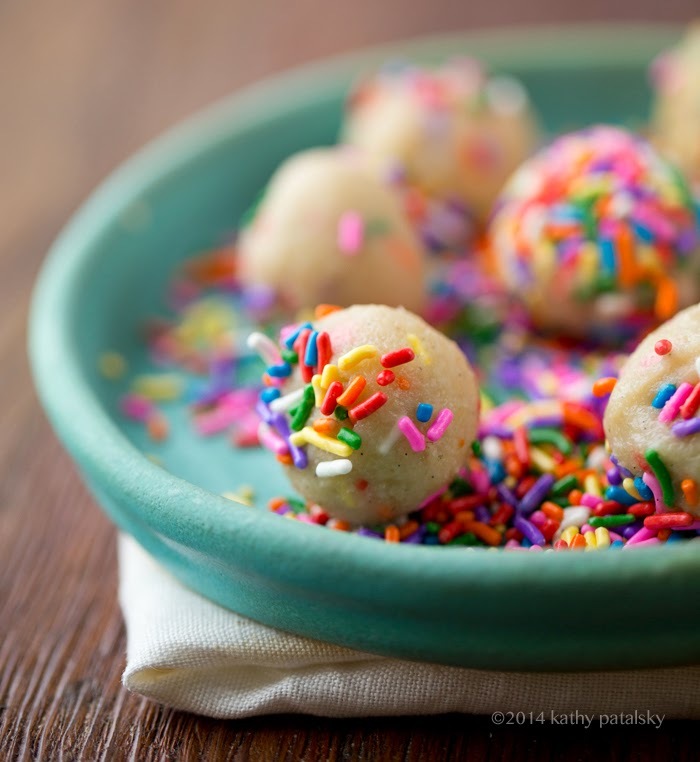 Cake Batter Truffles. 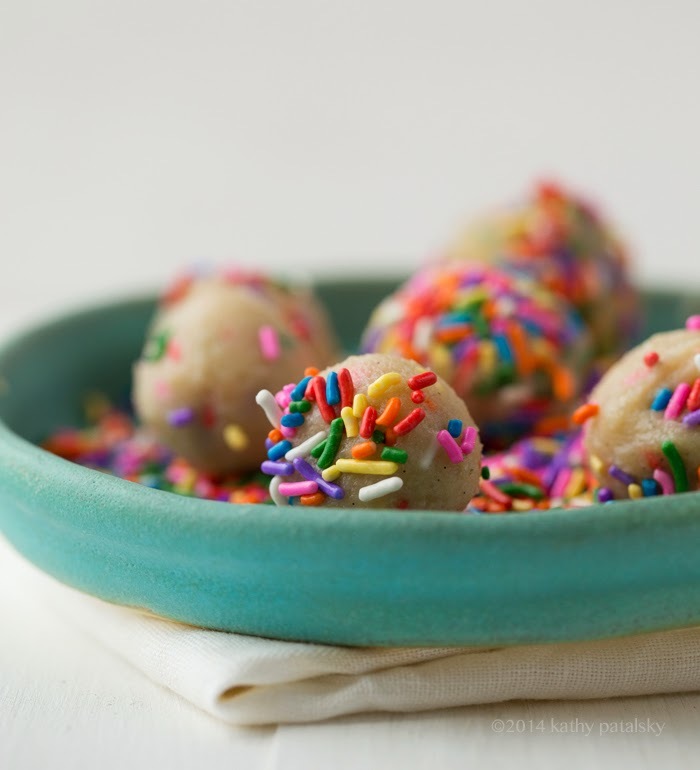 These truffles are made using creamy soaked cashews and coconut oil. 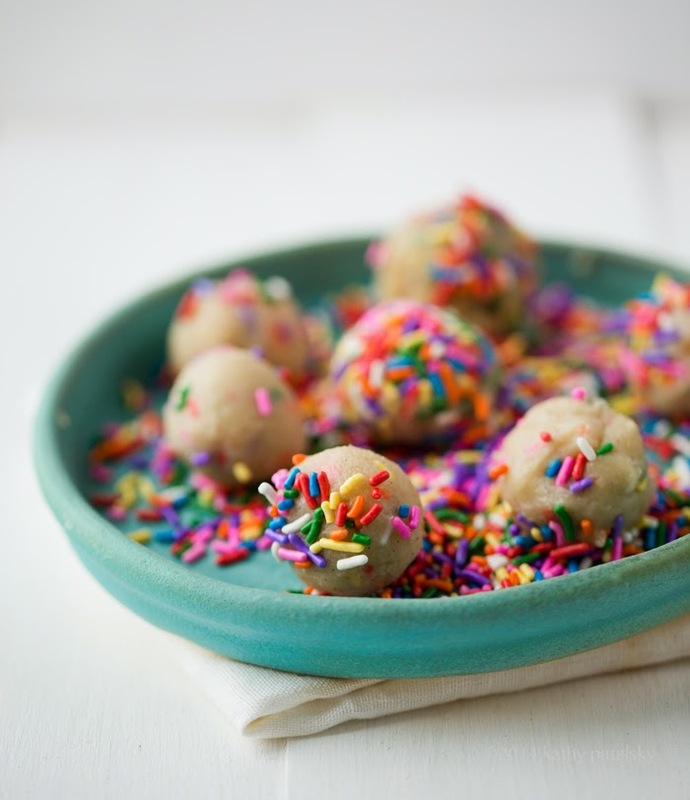 Vegan sprinkles add that "cake batter" coloring and a hint of vanilla bean does the rest. 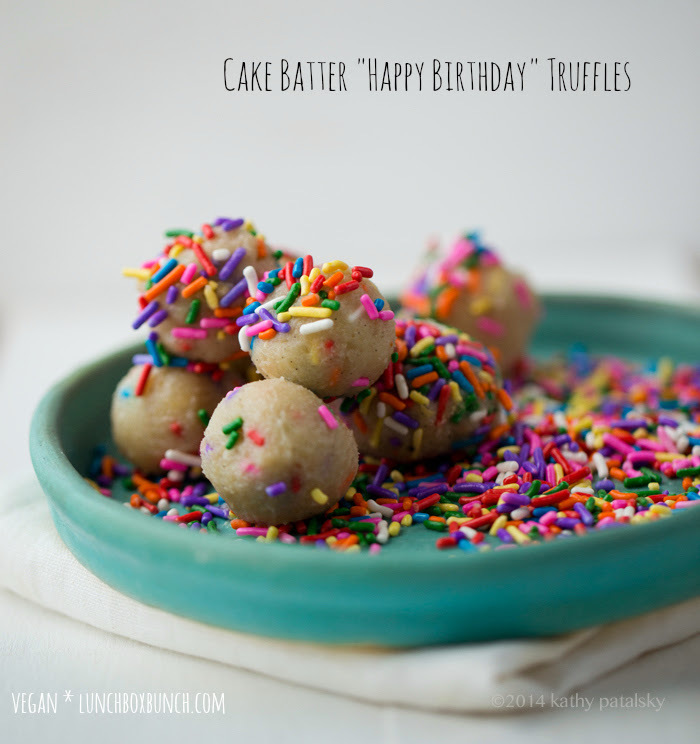 But before my bday treat (recipe below), a few bday wishes. 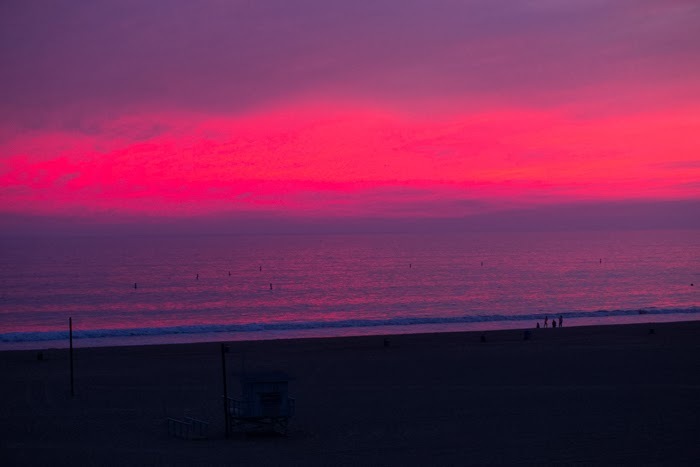 Birthday wish: pink sunsets, always. But anyways, enough about me. For my birthday this year I wanted to do something nice for my favorite furry friends. Since we still are not ready to adopt a new kitty (though we hope to soon) I decided to "adopt" a kitty. And remind all of you guys that YOU can help too if you want to. There are so many ways to give love to animals. And yes, going vegan is one of them. So.. Meet Gallie! The kitty I "adopted" via Blind Cat Rescue. Aw, head rubs. Though I will never actually meet this sweetie pie, I am so happy to know that I am helping her in a tiny way. About Gallie from BCR: "Gallie came to us from Brevard County Animal Control in Florida. We were notified by a citizen that she was there and with lots of help by lots of wonderful people, she came to us. A Huge thank you to Diane & Bill from Atlanta Animal Clinic in Pompanao Beach, Fl for driving 5 hours to pick her up and bring her back to their clinic , Also a huge thank you to Elizabeth, her mother & Mindy, Ivonne for facilitating her journey to us by driving 10 hours to bring her to us. She is super super sweet and I know is going to feel so much better once her eyes are taken care of." How to help? For just $30 a month ($1 a day!) you can adopt a rescued kitty at the Blind Cat Rescue. There are SO many kitties who need some help. You can even browse photos and pick out a kitty to adopt. More about BCR: "Blind Cat Rescue was started in 2005 to answer the need for a safe place for blind cats that were deemed unadoptable by regular shelters. They were going to be killed just because they are blind. And in 2011 we built a building to provide a safe sanctuary for FELV+ & FIV+ cats." For my bday wish, I hope all these kitties and pups have many more happy birthdays to come! Farm Sanctuary - One of my faves. Love the amazing Gene Baur! Sea Shepherd - amazing group. And if you have been following the dolphin slaughter in Taiji Japan you know the amazing work that organizations like SS do, and how crucial they are! ASPCA - helping animals, fighting for animals! Humane Society - they do amazing work, and I am a big fan of Wayne Pacelle! Teal Cat Project - found this via Isa Chandra, who is one of the founders, love everything about TCP! I am the proud owner of three teal kitties. Hendrickson Boards - awesome company that supports a wide number of shelters and animals, plus they sell super cute tees "every purchase saves animals around the nation"
2. Add all ingredients to a blender or food processor and blend until silky smooth. Pour mixture into a small bowl. Fold in the sprinkles, leave out a few or more for coating. 3. Place mixture in the freezer until firm enough to work with. 4. 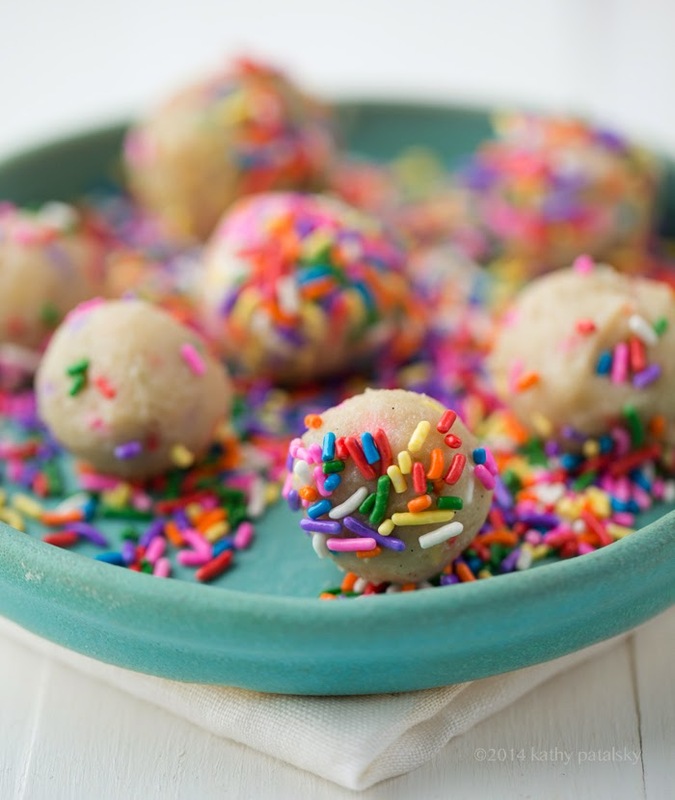 Scoop small balls once the mixture is firm enough (but not too hard) and roll into balls. Place on a greased plate and place back in the freezer to fully firm. Serve chilled or slightly warmed to room temperature.